Sara Loach and Ashlyn Beaty were recognized on Senior Day by the St. Mary’s softball program. From left are Coach Stephen Wren, Loach, Beaty, and Assistant Coaches Ryann Bizette and Dave Cupp. 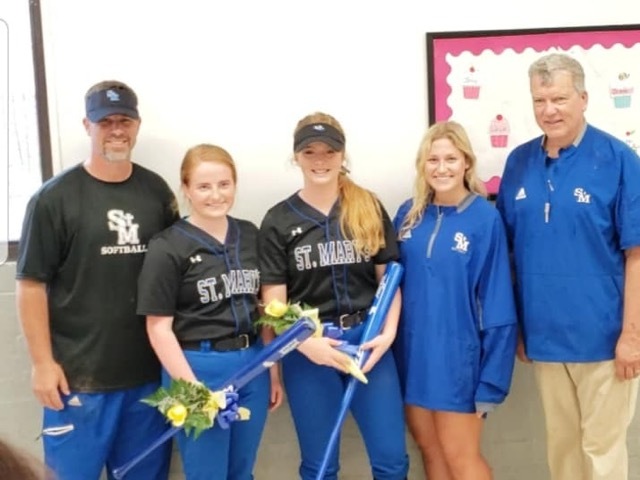 St. Mary’s recognized softball seniors Ashlyn Beaty and Sara Loach between games of a double-header April 6. Inclement weather drove the Lady Tigers inside shortly after the start of the second game where the team hosted parents and friends and the visiting St. Martinsville Lady Tigers at a meal of jambalaya. Coach Stephen Wren said, “The St. Mary’s program would like to thank these seniors for their hard work and dedication. We would also like to thank the parents for allowing their daughters to be part of the team. You will be missed. Thank you ladies.” Loach, #14, is the daughter of Chris and Karen Loach. She has been a member of the St. Mary’s softball team for five years. She is a member of the National Honor Society, Beta Club and Fellowship of Christian Athletes. She is the Student Council vice president and was a Girl’s State delegate where she won the Good Citizenship Award. She was a member of FBLA and qualified for State three years in a row. She received the 11th grade English Award. After graduation, she plans to attend LSU and major in communications. Beaty, #15, is the daughter of Ben Beaty and Leslie Sumpter. She has been a member of the team for two years. Before transferring to Louisiana School for Math, Science and the Arts, she played two years at Sulphur High School. Beaty is a National AP Scholar, attended Girls State and won first place in distract and state literary rallies in Spanish 4. She is a member of the Beta Club, National Honor Society, Hispanic Honorary Society and is an ambassador for LSMSA. Beaty plans to attend Baylor University where she will study kinesiology and later receive a doctorate in physical therapy.